Traditional craftmanship used in the painstaking restoration of one of the north-east’s most historic castles was recognised last night with a top award at an Aberdeenshire Design Awards ceremony. Craigievar Castle reopened to visitors early this summer after being closed for two years as teams reharled the National Trust property near Alford, after removing a cement-based mix that had coated the building since the 1970s. The £500,000 renovation was launched after it was found the treatment had been trapping moisture and causing serious dampness in the 17th-century castle. A traditional and breathable lime wash replaced the harl, and returned the A-listed castle to its original appearance. Specialist teams from Laing Traditional Masonry – which is based at Castle Fraser Stables, near Kemnay – rounded off the project earlier this year by hoisting in place several replacement stone water spouts they had carved to match surviving features and lookalike cannon high on the tower. Managing director Steven Laing said it had been a great honour to play an important part in restoring one of Scotland’s most prestigious castles to its full glory. 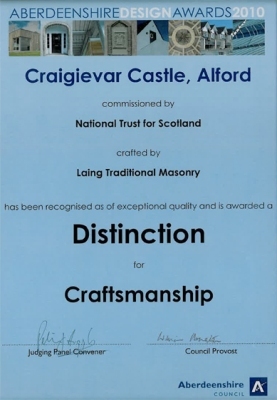 At a reception in Haddo House, near Tarves, last night the Craigievar Castle project topped the craftmanship section with the award of a distinction to the firm and clients the National Trust.